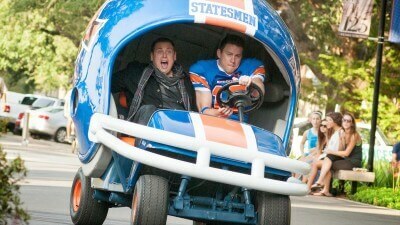 Pretend you were excited for the big screen version of 21 Jump Street. Yeah, nobody believes you. Writers Michael Bacall and Jonah Hill teamed up with directors Phil Lord and Christopher Miller for the most hilarious, self-aware adaptation of a Richard Greico television show ever attempted. A sequel was inevitable. Yet somehow this sequel is far better than we deserve. As promised at the end of the first film by their boss, Captain Dickson (Ice Cube), Schmidt (Hill) and Jenko (Channing Tatum) have returned to go undercover as college students. Their mission is to do, literally, the same thing they did in the first movie and chase down the makers/distributors of a new drug. Deputy Chief Hardy (Nick Offerman) makes this clear in the film’s first of many explicitly meta-sequences; he explains that because Jenko and Schmidt’s first effort was an unexpected success, they have invested a great deal of money in a new venture, with the expectation that repeating what worked last time will lead to bigger results. Somewhere the guy who greenlit The Hangover Part II is nodding in approval. So Schmidt and Jenko head to M.C. State University. Schmidt gets entangled with the smoking-hot and way-out-of-his-league Maya (Amber Stevens), Jenko has an epic bromance with a college quarterback named Zook (Wyatt Russell) and pretty much everything that happened in the first film happens again, with a twist! The sight gags are bigger, the chemistry is better and the laughs are in excess of anything that could have been predicted given the schlocky pedigree of the source material. Lord and Miller not only squeeze the increasingly dry rag that is Jonah Hill to release what remains of his quality comedy liquid, but they have turned Channing Tatum into something of a deft comedian. And yet, it’s Jillian Bell who steals the show. As the unrestrained, mean-spirited Mercedes, Bell gets the most laughs per minutes of screen time, which is the only comedy metric that matters. Her verbal abuse of Jonah Hill is so savage, so unrepentant, that it feels like the release America has desperately needed. Really, everyone in the film is great, with the exception of the luminous-but-vacant Stevens. It’s not her fault really, as the script uses her as nothing more than an attractive plot device, albeit one that leads to the biggest laugh in the film. The self-awareness that elevated the first film is turned up full blast here, with seemingly endless acknowledgments of stunt casting and an overreliance on improvisation. But Lord and Miller aren’t content to simply put lazy action movies on blast; they dispatch comedy justice upon sequels of all kinds and mock the latent homophobia that lingers in bro-comedies. At the end of the day, comedies are judged by one thing and one thing only: laughs. If there’s a funnier comedy sequel than 22 Jump Street, it probably didn’t suggest the studio should market an at-home children’s shooting game with phalluses as the targets. So, 22 Jump Street wins.